Performers include: Susan Saint James, Jane Curtin, Frederick Koehler, Allison Smith, and Ari Meyers. Created by Sherry Coben, this sitcom centers around two adult ladies who’ve been friends since childhood. They’re now both divorced and decide to raise their families together in a brownstone in New York City’s Greenwich Village. They are two strong, independent women who are solid on their own, but not against the idea of remarrying. Kate McArdle (Susan Saint James) is a bit frivolous, free-thinking, and works as a travel agent. She and her ex (a part-time actor) have a teenage daughter, Emma (Ari Meyers). 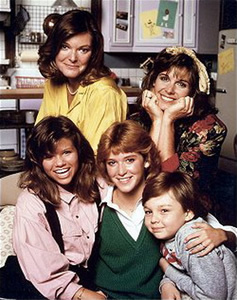 Kate’s childhood friend, Allie Lowell (Jane Curtin) is more traditional-minded and stays home to do the cooking and cleaning. While Kate struggles for control in her workplace, Allie is the exact opposite, seeming much more sure of herself. Her ex is Charles (Paul Hecht), a doctor who was unfaithful during their marriage. They have two kids, teenage Jennie (Allison Smith) and her younger brother, Chip (Frederick Koehler). Charles eventually remarries to Claire (Wendie Malick). Each episode begins with Kate and Allie having a short conversation. It often has nothing to do with the episode’s storyline but helps the ladies’ close relationship and their unique ways of looking at the world.